Last Saturday, the big day was finally here. Chris and I got married and it was fabulous! We did it right on the beach at Lake Tahoe, and it was one of the most beautiful days I have ever seen. 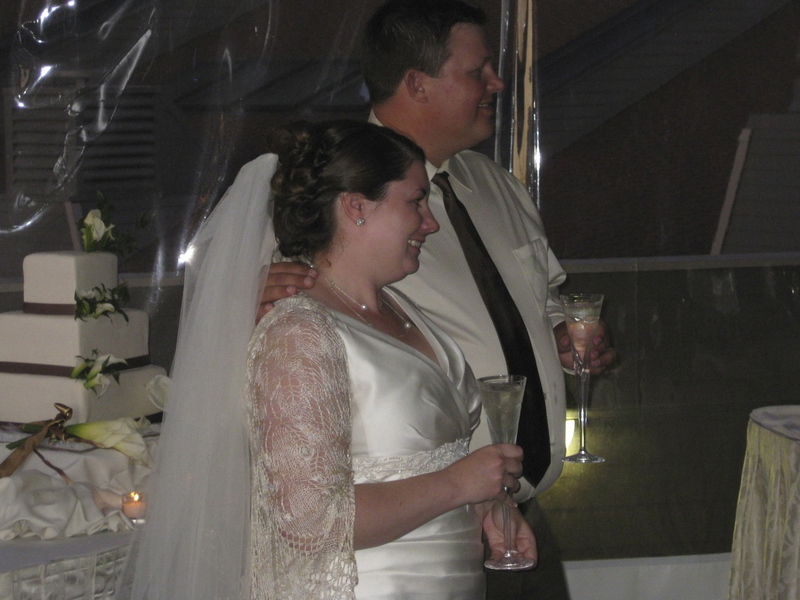 We kept it fairly small with just family and close friends which was exactly what we wanted. I wish I could say that the days leading up to the wedding were completely stress free, but they definitely were not. And it was all my fault too. Everything with the caterer, and the venue and the florist, and all those things people usually have a problem with were perfect. My mom was especially wonderful and made sure that everything looked just the way we envisioned it would. 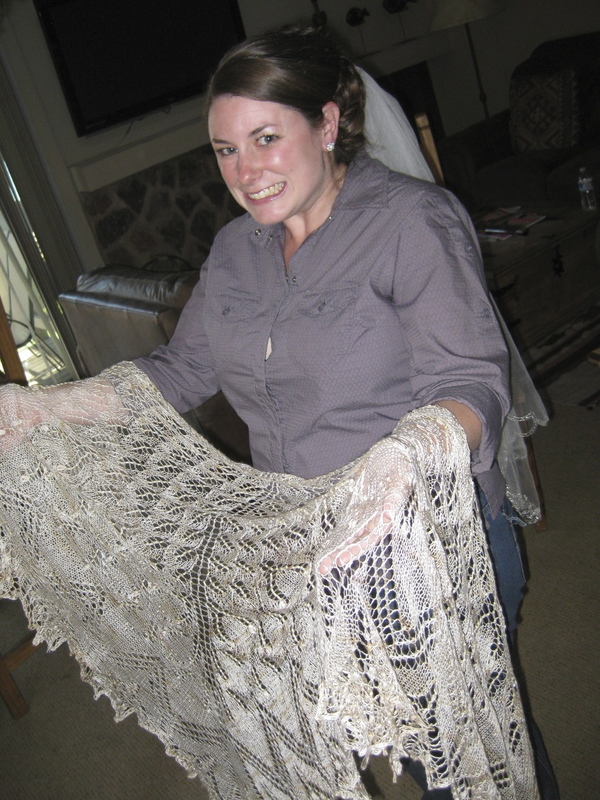 However, my penchant for procrastination almost caused me to not finish my wedding shawl. I was up until 2:30 am the day of the wedding blocking it...fortunately it dried quick and everything turned out fine. I do want to re-block it at some point because I was definitely cutting corners and I want to make the edge decoration a little more even and nice looking. Of course, only me or another knitter would notice something like that! Overall, I feel as though I have created my personal Holy Grail of knitting. I got serious about knitting 4 years ago, and about 2.5 years ago I found Ravelry. Aeolian was one of the first patterns I fell in love with, but it was way above my skill level. I knew I would make it eventually though. 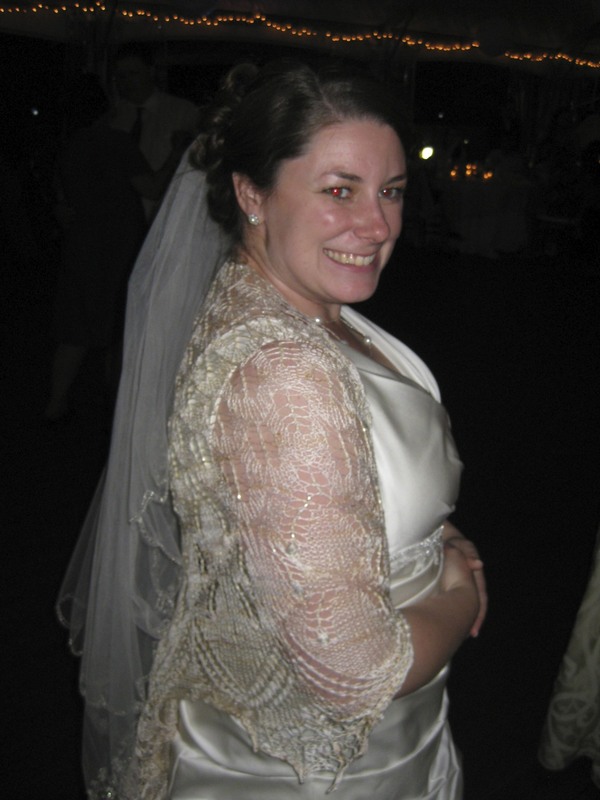 When I got engaged, I knew I had to make a shawl, and I also knew it had to be Aeolian. I had advanced enough in my knitting that even though there were tons of new techniques (beads and nupps for starters!) I dove right in anyway. And then I put it down....for months, and months. I didn't even progress past the first chart until a month before the wedding! Needless to say, it came down to the wire. 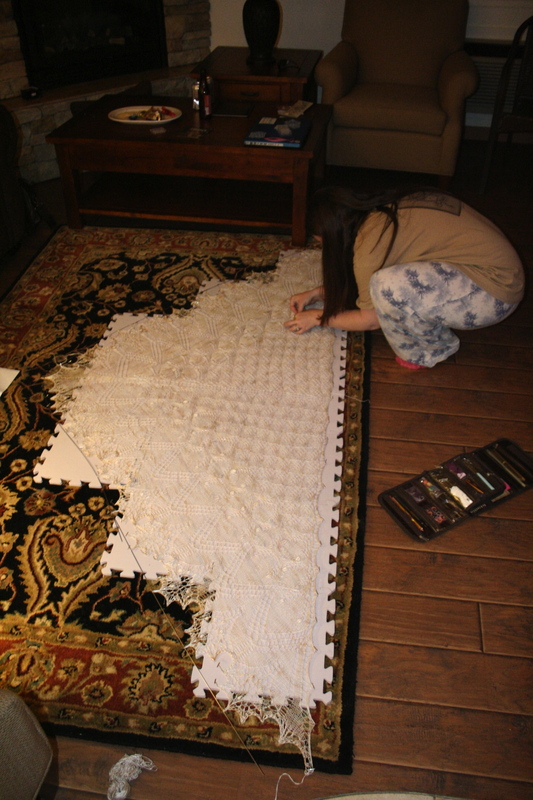 I knit the final 46 row chart in around 4 days which must be a record or something! There were several painful moments, and lots of late nights, but it was totally worth it. It turned out beautiful and will be something really special to pass down to our future children. Here is some quick info about the shawl. I knit it in Handmaiden Lace Silk, and the colorway is ivory. Since the skein was 984 yards, I decided to fudge the size a little to maximize yardage. I ended up knitting a size exactly between the shawlette and shawl. In other words, I did the yucca chart 8 times, the agave chart 2 times and then followed the rest of the charts as written. I never counted the stitches but it should have been around 750 by the end. I ended up with a large, but delicate and lovely shawl and I am so proud of myself for finishing it! I didn't even make a mistake that required going back more then a few stitches. You may be wondering, what was so important that I put off knitting my incredibly complicated wedding shawl until the month before the wedding? There is a very good answer to that question (other then that I am crazy! ), which you will have to check back to find out about!